A nationwide agrotourism program offers a breathtaking view of Switzerland. Contributor Joel Reichenberger was recently honored by the American Agricultural Editors Association with two of ag journalism’s most prestigious awards: Story of the Year and Photo of the Year, both for his piece in the Spring 2017 issue of The Furrow, “Sleeping On Straw.” Joel’s award-winning story details the efforts of Swiss farmers to boost agritourism, and features stunning photography of some of the most scenic farmland in the world. Just in case you missed it, we’re once again featuring Joel’s story here…enjoy! 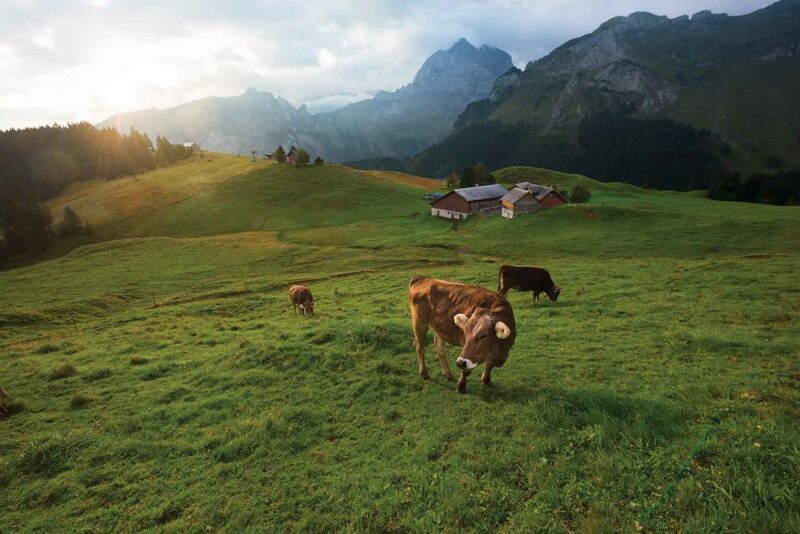 The faint sound of a far-off refrain fades in-and-out of the soft clanging of cowbells that is a constant on the high meadows of the Swiss Alps. Straining to hear the tune in the cool night air outside a village restaurant are nine people—four American tourists, three Swiss hikers, and the couple who run the small establishment. After an evening of loud stories and boisterous laughs, all are silent now—at the encouragement of one of the hikers—to hear the subtle tones that ever-so-barely cut through the din of the cow bells echoing off the mountain walls. Real is the best word to describe a stay on the nearby farm of Kathy and Anton Furrer-Gisler. Their ‘heimet’ — or small farm —is named Kneiwies and is located near the small, unincorporated village of Gitchenen, Switzerland. The farm teems with life, from chickens to sheep, a trusty border collie to a pen of rabbits and, of course, a herd of cattle —each adorned with one of the iconic bells. The setting evokes a storybook scene where the Furrer-Gisler family maintains a rugged and authentic lifestyle amid breathtaking beauty. Like the herdsman singing in the mountains, they don’t do it for the tourists—they do it for themselves. However, they do let tourists stop by sometimes to enjoy the sights and sounds. The Kneiwies farm is located on a hiking trail and can accommodate overnight stays in a vacation apartment in the farmhouse, but bedding down in the barn is a unique and economical option that will forge lasting memories. A bed of straw. Kneiwies is off the major tourist track, doesn’t make the guidebooks, and most internet references to the farm require translation from German. In addition to beautiful scenery and a unique travel experience, it offers an economical place to spend the night. 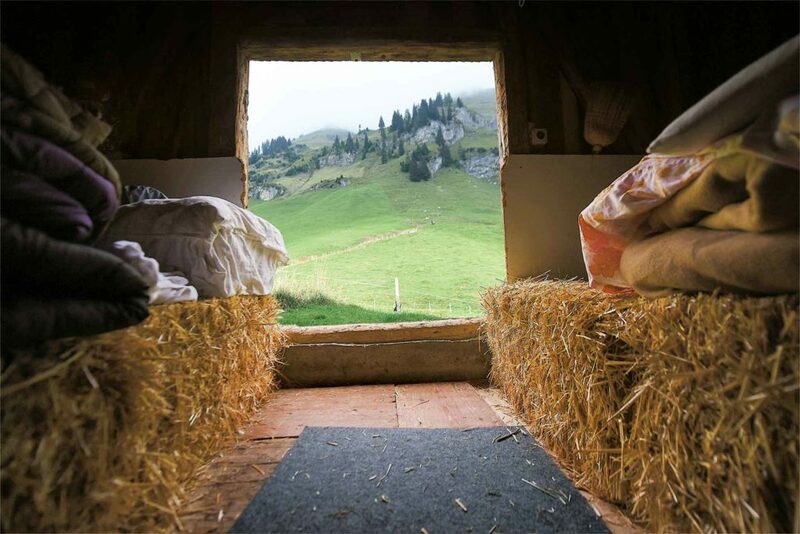 The farm is a participant in Switzerland’s Schlaf im Strohl — Sleep in Straw —program (www.schlaf-im-stroh.ch), which is designed to bolster the income of Swiss farmers and delight visitors from near and far with a unique agrotourism encounter. 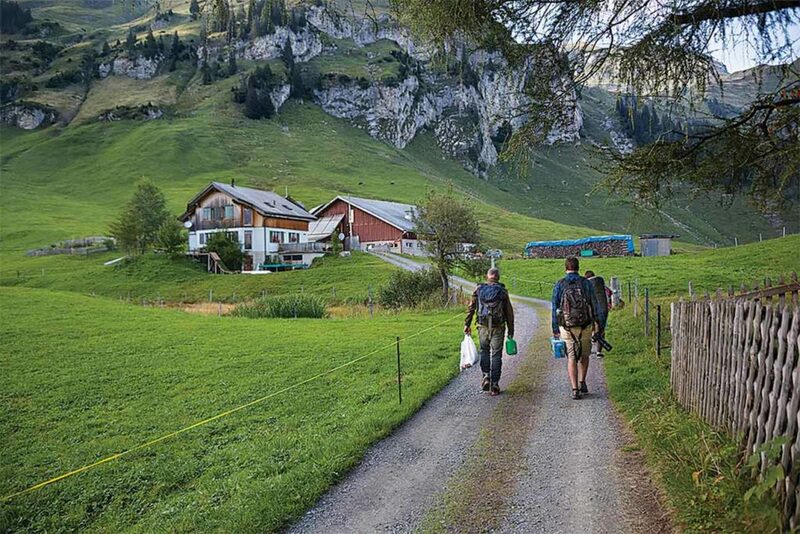 Rural areas of Switzerland have long been geared to serving the needs of hikers, bikers, and outdoor enthusiasts — many farms offer vacation apartments or chalets for overnight stays. In 1993, farmers in the canton (state) of Jura — a region along the French border favored for hiking and horseback riding—saw a summertime opportunity in their barns left empty when their cows were moved to mountain pastures. With a thorough cleaning and fresh straw, barn stalls could make affordable accommodations for travelers. The idea quickly spread to all the country’s 26 cantons, and the Swiss Farmers Union stepped up to standardize the network, conduct annual inspections to ensure safety and sanitation, and to coordinate marketing efforts. The program is still managed primarily by farmers, but in the year 2000 the marketing efforts were taken over by Switzerland’s Office of Agrotourism. “It has been a win-win effort for both tourists and the farmers,” says Andreas Allenspach, director of Agrotourism. “Tourists are eager for cheap accommodations where they can stay the night, have breakfast and continue their trip either hiking or riding to the next farm. “The idea has been a hit with farmers as well and nearly 150 now participate. They like improving the image of agriculture in Switzerland and they also like the additional income,” says Allenspach. Sleep in Straw is popular not just with foreign visitors, but also with local hikers and Swiss school groups looking for a field trip. Farms vary greatly in what they have to offer, from large barns with room for twenty or more visitors to small, more intimate spaces. Many also offer more traditional lodging — including a real bed and mattress. Allenspach says the program logs roughly 50,000 overnight stays per year and provides an exposure to all parts of the country and to the many facets of Switzerland’s diverse agriculture. Visitors can sleep on a bed of straw at a vineyard, bed down at a horse farm, or wake up to help with chores on an organic dairy in either an alpine valley or on a rugged mountain plateau. The storybook life. For Kathy and Anton Furrer-Gisler, the draw to joining the Sleep in Straw program was the added income from taking advantage of a barn they didn’t otherwise use in the summer months-—the cost of an overnight stay is about $40, and the farm hosts around 130 visitors per year. Switzerland’s appeal lies in its rugged mountains, lush green valleys and picturesque farms and villages. “The money is nice, but we do this mostly because it gives us a chance to meet people from all over the world and accommodate them on our farm,” says Kathy, “We live from the land and like bringing it closer to our guests. Frankly, I think sometimes we forget how beautiful the familiar can be,” she adds. By standards of the program, their farm is remote. The two-hour journey from Zurich leads visitors through small villages, up steep roads and around hairpin turns. And, the trip is occasionally interrupted by shepherds who take over the narrow road while driving sheep from one pasture to another. From a parking lot on the valley floor, visitors take a cable car — a ski lift during the winter — to climb 3,000 feet before a quarter-mile walk leads to the small Kneiwies farmstead. There’s a building for milking the cows and pens for the chickens and rabbits, but a fat hog seems to rumble through the farmyard seemingly at will. And, there’s a barn supplied with fresh hay, a sleeping bag and woolen blankets that make for a divine night of sleep for weary travelers. A small kitchenette and restroom is built into one corner of the barn. Kathy speaks little English, but for travelers who speak even less Swiss German, she proves eager to line up a reservation at the only available restaurant in the village — a small establishment near the top of the cable car lift and operated by Franz and Claudia Pries. The hosts ladle up a four-course meal headlined by a main dish of beef stroganoff more like they’re serving guests in their home rather than customers in a restaurant. When the meal’s finished — and if guests are really lucky — they may be called to the porch to listen not to the bells on the cows but to the shepherd’s prayerful song — his Betrof — which carries for miles when amplified through a wooden milk funnel, which is the traditional approach. Later, Franz is prone to giving lessons on his alphorn — the long, curved wooden horn that is a trademark symbol of Switzerland. “It dates back to medieval times and served many functions including calling cows in from the pasture at milking time. It was also used as a way to communicate between villages that were too small to have a church with a bell,” Franz says. The woodwind instrument — prominent in the works of Brahms and Mozart — proves difficult to play, perhaps why the Swiss Yodeling Association lists only 1,800 approved alphornists. A member in an alphorn band, Franz displays his talent on an 11-foot long horn that plays a single pitch. Other musical ranges require a different length alphorn. Fresh hay. Morning brings a typical Swiss Bauernfruhstuck — farmer’s breakfast — of fresh bread, homemade cheese, and jam. It also brings a steady stream of hikers making their way along the trail that runs through the farm, including a hunter headed down the mountain with an ibex thrown over his shoulder. Morning also means chores and soon the cows are back on the pasture and the chickens are out of their coop, bouncing around the farmyard. Anton throws a scythe over his shoulder and heads up the hillside. Hiking a half-mile over the rocky slope, he reaches the last of the summer’s uncut forage. With wide sweeps of the scythe, he harvests the hay, pausing occasionally to sharpen the tool. Soon, two large bundles of grass are gathered into a cargo net and attached to an overhead wire and pulley system that’s supported by a line of makeshift towers running down the hill. The bundle is then trollied effortlessly down to the farm below. It can’t have been done much differently 100 years ago because he doesn’t do it this way to impress the tourists. He does it because, high in the Swiss Alps, on a picturesque farm in a storybook valley, that’s the way it’s really done today. Plan for immediate and long-term survival.